Emirates and global leader in the meetings industry, MCI Group, recently announced a global alliance that will see Emirates becoming the official airline of its large and international events. MCI in turn will be the preferred Professional Congress Organiser (PCO) for Emirates. The strategic partnership will help Emirates build a strong Mice (Meetings, Incentives, Conferences and Exhibition) commercial brand in the meetings industry and better cater to its diverse and frequent business travellers. 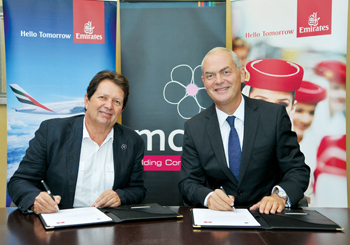 Thierry Antinori, executive vice-president and chief commercial officer formalised the agreement with MCI’s founder and chairman, Roger Tondeur at the Emirates Group Headquarters. 'The Mice segment is rapidly growing and we are always looking to connect our customers to what matters to them. At Emirates, we are well positioned to cater to the needs of business travellers worldwide with the latest facilities we offer on our modern wide-body jets and excellent on board service from our international cabin crew who speak over 60 languages. Our partnership with MCI will allow us to work even more effectively on the complex requirements of the meetings industry making corporate travel more convenient and affordable for our customers,' says Antinori. The partnership will see Emirates connecting delegates from across the globe to key business hubs such as Australia, Asia, Europe and the Americas. With a global reach spanning over 140 cities on six continents, Emirates will provide delegates from across the globe with one-stop connectivity between continents.